Well, there is not much more that can be said about Olivier Giroud's goal on Sunday that hasn't already been said, unless I make up a few new words to describe them. That'd be pretty original, wouldn't it? Condivinious (from the Latin for with divine intervention, or something) scorpion kicks notwithstanding, Arsenal dominated the proceedings against Crystal Palace, even without Mesut Özil pulling the strings in midfield. It was a necessary effort as Arsenal tries to keep pace with the league leaders. They remain nine points back of Chelsea for the top spot in the league now that the season has reached the halfway point. Nine points is doable over 19 matches, but if that number climbs into double digits, then that's a hell of an ask. Everyone has played everyone else once now (well, six teams have now played six others twice since there were matches yesterday) and the real serious part of the season begins now. Arsenal's title hopes faltered first in January last year, then a second time in March. Draws at Liverpool and Stoke before losing at home to Chelsea were the initial failings that saw Arsenal's ambitions fade, even though losses to Manchester United and Swansea more memorably crushed those hopes, since those followed their "turning point" win over Leicester. What better way to start the second half of the season than with a potential trap game? There has been quite a bit of flux in Arsenal's list of available players as of late. Mesut Özil was a surprise absence on Sunday through illness, and prior to the match, Arsène Wenger made it sound like he was a serious doubt for this trip as well. Arsenal have also been without Kieran Gibbs and Theo Walcott through the holiday period as well, but regained Alex Oxlade-Chamberlain and Aaron Ramsey on Sunday, as both came back from hamstring injuries to make appearances from the bench. Shkodran Mustafi also returned to the bench on Sunday, but his presence was not required. For this match, Arsenal will lose Mohamed Elneny to the Egyptian national team during the Africa Cup of Nations; Egypt's group stage matches are against Mali, Uganda, and Ghana on January 17, 21, and 25 respectively. The tournament runs through February 5, meaning Elneny will miss anywhere between four and seven Arsenal matches, depending on how far Egypt advances as well as whether Arsenal progresses past Preston in the FA Cup. It's hard to tell how much rotation Arsène Wenger will opt for here, considering they played two days ago, but also have a cup tie against a lower divsion opponent coming up on the horizon. I would guess that Mustafi will return to the XI, as well as Francis Coquelin to replace the absent Elneny. Alex Oxlade-Chamberlain could push for a start, but I don't know who you remove from the attacking quartet, all of whom played so well against Palace on Sunday. The easiest to slip out would be Lucas Pérez. Predicted XI: Čech, Bellerín, Mustafi, Koscielny, Monreal, Coquelin, Xhaka, Oxlade-Chamberlain, Alexis, Iwobi, Giroud. Without Jack Wilshere, Bournemouth will likely bring Josh King into the number 10 role. Marc Pugh and Lewis Cook are both unavailable through injury; the former is out with a hamstring injury and could be back at the weekend, while the latter suffered an ankle injury in late October that ruled him out three months. Callum Wilson, who scored from the penalty spot at the Emirates in November, could push for a return to the starting XI after Arsenal product Benik Afobe started up top against Swansea. 18th century philosopher Adam Smith will push for a start to replace Ryan Fraser in midfield. These substitutions might be a bit harsh, as both Afobe and Fraser scored against Swansea at the weekend. Predicted XI: Boruć, Francis, S. Cook, Aké, Daniels, Surman, Arter, Smith, Stanislas, King, Wilson. Arsenal look to have righted the ship a little bit after stumbling at the start of the holiday period, but winning your home games is a different story than winning away from the Emirates. Arsenal enter this match still having lost two straight away from home. If there's any light in that statistic, it is that they have scored in 12 consecutive matches away from the Emirates, though they have not kept a clean sheet away from home in their last seven road fixtures across all competitions, dating back to their late smash-and-grab 1-0 against Burnley on October 2. The last club to keep Arsenal from scoring in a road game was Leicester City in that 0-0 draw in August, a result that didn't feel bad at the time, but now looks like two points dropped. Bournemouth ran out comprehensive 3-0 winners over Swansea in their weekend fixture on Saturday, further burying the Swans at the bottom of the Premier League table. The win snapped a two-match losing streak for the Cherries after they had fallen to Southampton and Chelsea earlier in the holiday period. The run of results leaves Bournemouth at 10th in the league table entering yesterday, behind Southampton on goal difference but level on 24 points. It should be noted that Bournemouth have yet to win consecutive fixtures this season; they have not won consecutive matches in the league since a three-match winning streak in March. Arsenal won the reverse fixture at the Emirates 3-1 in February. In four meetings between the clubs, it was the first time Bournemouth had scored a goal. Alexis Sánchez opened the scoring on 12 minutes by pouncing on a poorly hit pass from Steve Cook that failed to reach goalkeeper Adam Federici. The Cherries, however, were level from the penalty spot on 23 minutes when Mike Jones ruled that Nacho Monreal fouled Callum Wilson. Arsenal were rattled, but did not concede another, and Theo Walcott scored the go-ahead goal from the back post on 53 minutes. Alexis added his second and Arsenal's third in the 91st minute. Adam Federici must have nightmares about the Chilean; you'll recall that Federici was Reading's goalkeeper when Alexis scored twice in the 2015 FA Cup Semi-Final, the second coming from a Federici howler in extra time. Back in November, Federici was deputizing in goal for the injured Artur Boruć. 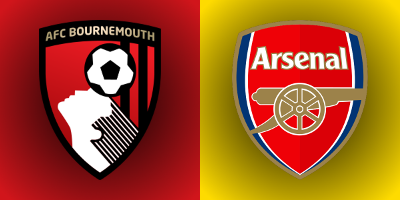 Arsenal won both fixtures against Bournemouth last season by 2-0 scorelines; at the Vitality in February, Mesut Özil and Alex Oxlade-Chamberlain scored Arsenal's goals 88 seconds apart. The referee is Northumberland-based Michael Oliver. Oliver gained a large amount of goodwill in Arsenal circles back in March of 2015, when he worked Arsenal's 2-1 FA Cup win against Manchester United at Old Trafford, in which he became one of the first referees I've ever seen to not get fooled by any of United's... duplicity at home. Oliver has worked two Arsenal matches so far this season, both being rather large home fixtures. He took charge of Arsenal's season-opening 4-3 loss against Liverpool as well as the 3-0 win over Chelsea in September. Prior to the win over Chelsea, however, Arsenal had not won with Oliver as referee since the FA Cup tie at Old Trafford; before the loss to Liverpool, Arsenal had drawn three straight such matches. This will be Oliver's first Bournemouth match of the season; last year, the Cherries drew both matches in which Oliver was the referee: 1-1 with Watford in October and 0-0 with Crystal Palace on Boxing Day. Oliver is one of only two Select Group referees to not yet show a red card this season. The other is Kevin Friend. John Painting is a contributing writer to the Modern Gooner and an amateur meteorologist. You can follow him on Twitter @zorrocat for drizzle changing to light snow after midnight in the higher elevations.